The Business Model or Canvas, as it is also known, is a tool that helps starting a proper business. 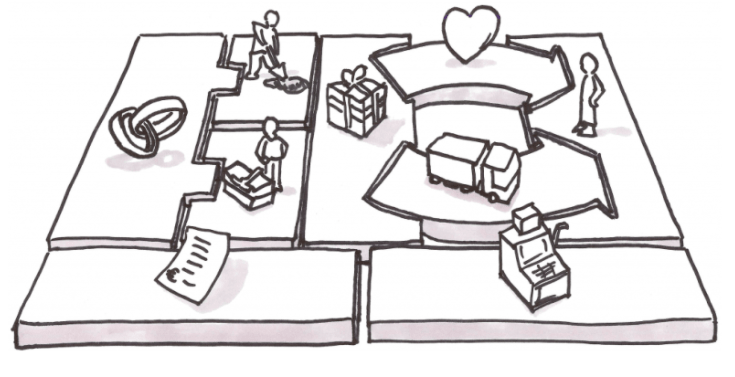 It was developed by the Swiss Alex Osterwalder to facilitate the complete understanding of a business. Thus, the model aims to describe all the elements and phases that make up an enterprise, providing the integration of the organization. According to the tool’s creator, the core components of a venture are: customer segments, value proposition, distribution channels, customer relationships, revenue streams, key resources, key activities, key partnerships, and cost structure. Based on a framework with organized blocks, as shown in the figure below, the Business Model provides the visualization of the main functions of an organization, thus enabling entrepreneurs to reflect on each function of the company to discover what needs to be done in order to win customers and increase the results of the venture. Who am I going to target? How much will I spend and how much will I get? To take advantage of the tool, the entrepreneur needs to know that each of these blocks is related to the others and that the adjustments in each phase can be made at any time, as many times as necessary, so that it is possible to perceive the business as a whole. Therefore, this is the way to discover how to differentiate, win customers, reduce costs and earn revenue. No problem if the idea still needs to be developed. The important thing is to insert it into the frame as this will help you visualize it better. Using post-itsis more productive because it allows adjustments to be made at any time. However, the tip is to start with the double value proposition / customer segment, since this combination presents the soul of the company. Even ifthe idea is not very clear, it is good to practice planning with the Canvas tool, because visualizing the idea helps you to perceive what can be improved. It is best to start by describing the value generation andthen organizing the efficiency of the value proposition on the left side. No problem if there are blank points. In this case, the entrepreneur can take the time he needs to complete, modify, choose and refine the template. Updating the business model is a way to compete with competitors who are always improving their processes. Constantly working on the board is a way to visualize periodic improvements in the enterprise. Using the chart serves to record and refine ideas. But before implementing them, it’s good to look for ways to validate with the client if the assumptionsmake sense. Try to make prototypes, demos, proposals and listen to the feedbacks, which always help to define the business model. How will the Business Model help me to make more profit? The entrepreneur must remember that innovation is the key to success. The Canvas Model enables the entrepreneur to introduce strategic innovations that will increase the company’s competitiveness. The Business Model is thus a way of improving the company’s management processes, which necessarily leads to better results, including financial results. Bahrain’s Social Insurance - Part 2: How Do We Get Out of This Mess?